I didn’t realise it’d been so long since I’d posted! Obviously just been really busy living life and the day-to-day humdrum that that brings. This was the rest of my stash order – the first I’ve had in a very long time! It means a couple more projects are now able to be fully kitted up, which is great considering one of them was in my Crazy 7 group of projects, and already started! Since the Crazy 7 challenge kicked off, I’ve actually been doing really well at keeping my stitching going regularly each week. While I may not have too much to show for it, my excuse is that I’ve started my very first HAED – Daisy Blue by Jo Lynch. Considering I’d always called my dear friend Nicki a crazy woman for her love of over-one stitching, and hating over-one stitching myself with a passion, it seems I’ve caught the craze myself! I’m stitching my HAED one-over-one on 28ct Lugana and I just can’t seem to put it down! I think in a couple of months I should see this one finished … and I’ve already got a couple more in line to be started immediately afterwards 🙂 The crazy thing is that I have Noah’s Ark by Teresa Wentzler as a seriously mistreated UFO because I couldn’t handle the one-over-one stitching … perhaps it may be time to give it some love and get it finished now! This weekend, though, I really had to force myself not to pick my HAED back up again, and instead caught up on a monthly SAL I’m going of JCS Christmas ornaments from the 2015 issue. So far I’ve managed the first three months, with Feb and Mar ornies hot off the Qsnaps this weekend (I managed the blackbird one in its entirety today!). Here are the three ornies to date so far (they’re being stitched in order of popularity in a group vote, with January being the most popular). As well as stitching regularly again, I’ve also joined a group of fellow stitchers to do a weekly cooking challenge. I think my health struggles over last couple of years had really shaken my confidence in many areas of my life, and cooking was one of them. It’s been really nice getting back into the kitchen on a regular basis and cooking up some healthy (and not-so-healthy) meals. Even though I may not always like the ingredients chosen each week, I still make sure I give it a try and I’ve been pleasantly surprised with the results so far. At some point I decided a change of pace was in order, and I picked up a canvaswork project to stitch on. 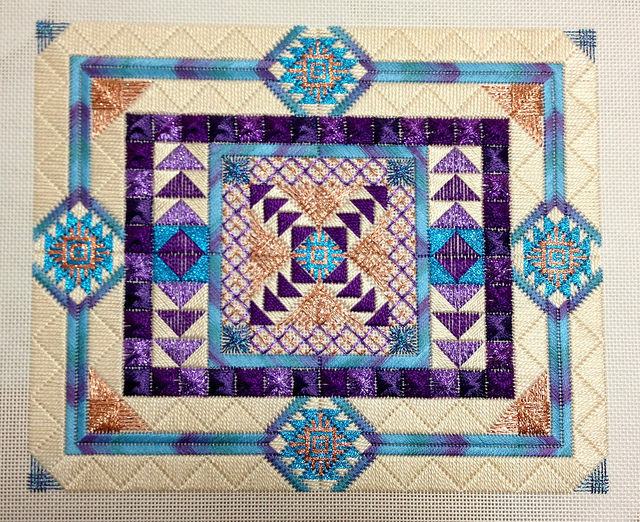 This was my next finished piece, finishing it in early July – and one of the first times in ages I truly enjoyed my stitching experience, even with all the metallic ribbons! Unfortunately I had run out of the turquoise ribbon, or it would have been finished much sooner! “Flight of the Bumblebees” by Ruth Schmuff – this one is a very old UFO that I’ve started making a conscious effort to get finished. Unfortunately, as per my normal luck, I’ve run out of one of the gold metallic braids, so I’m waiting for a stash parcel to arrive with the replacement (I had a splurge a month ago to finish kitting up some other charts that were missing threads). I”m pretty pleased with how this one is going, though, and it doesn’t have too much more to go before it’s finished. 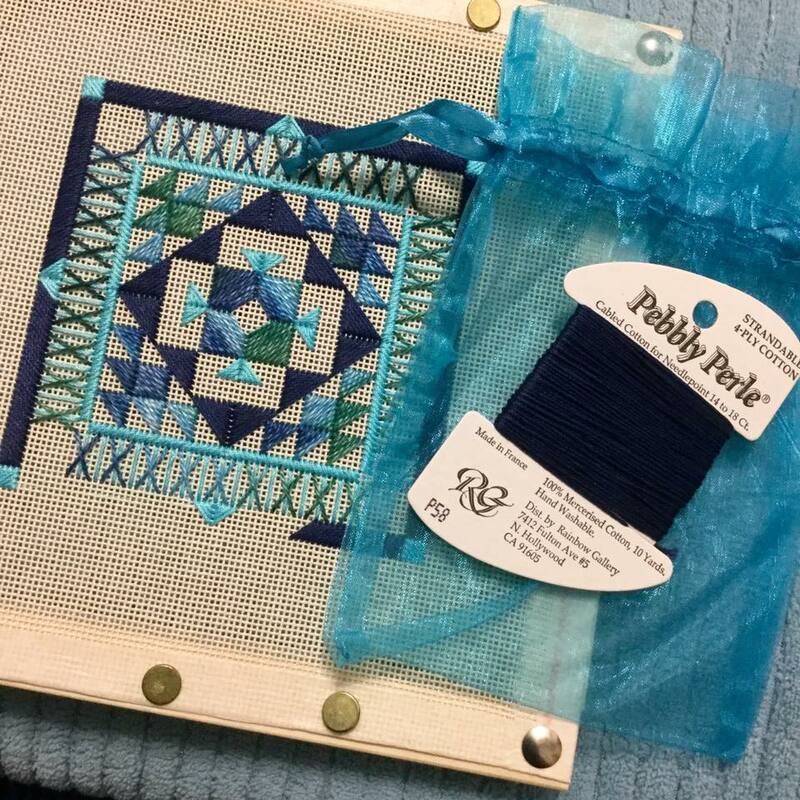 “Blue Birds” by Laura J Perin – While I was on a ‘canvaswork roll’, I decided to drag out a freebie from Laura J Perin I’ve had sitting in my stash for many years. Sadly, though, I ran out of the navy Pebbly Perle that was used around the border, so once again another design sits unfinished. 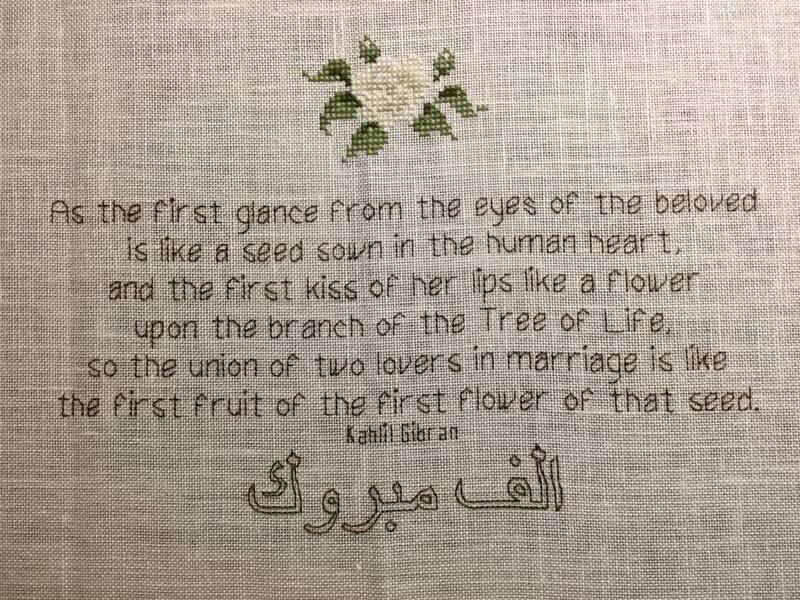 A wonderful fellow stitcher, though, came to my rescue quickly and sent me a card of the thread I need. As soon as I find my card of blue Tiara thread, which has apparently gone into hiding, I’ll be able to finish this one off pretty quickly. I just LOVE the colours of this one! If anyone is interested, the chart is still available for download at the Rainbow Gallery site. 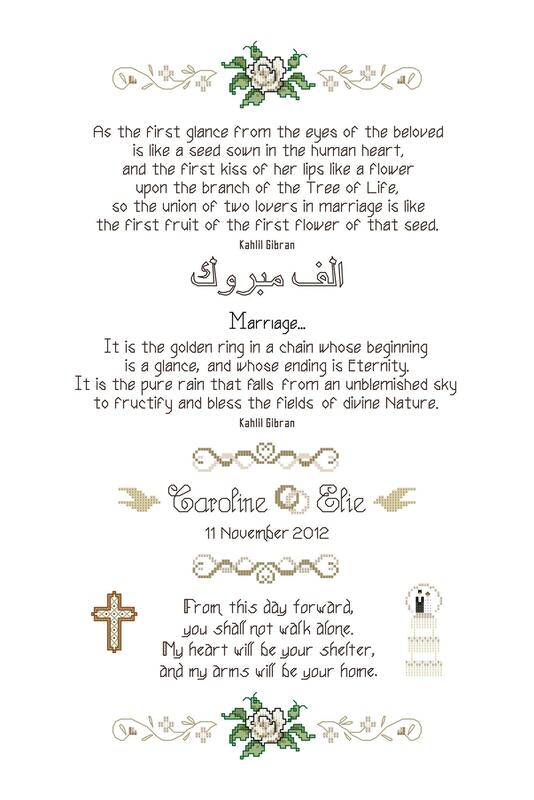 Wedding Sampler for Elie – This is a self-designed wedding sampler that I’m stitching for a close male friend. I struggled the whole way with this one, so I haven’t pulled my finger out and started it, and the wedding was nearly 3 years ago!! I’m still not 100% with the fabric and thread choice, but I’ve decided in this case I’m my own worst critic, and I should just continue on with it. 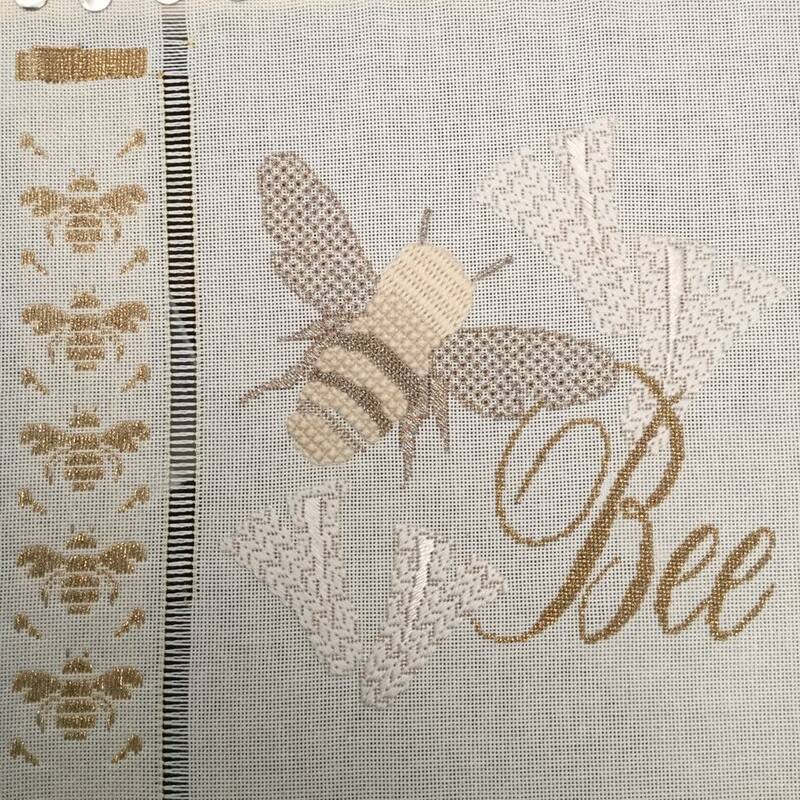 I think the groom will love it regardless of how it looks – the contents of the sampler are very personal to him, so hopefully it will be treasured. I’ve shown a picture of what the whole thing will look like once it’s finished. The photo isn’t very good at all, the fabric is a buttery creamy colour. 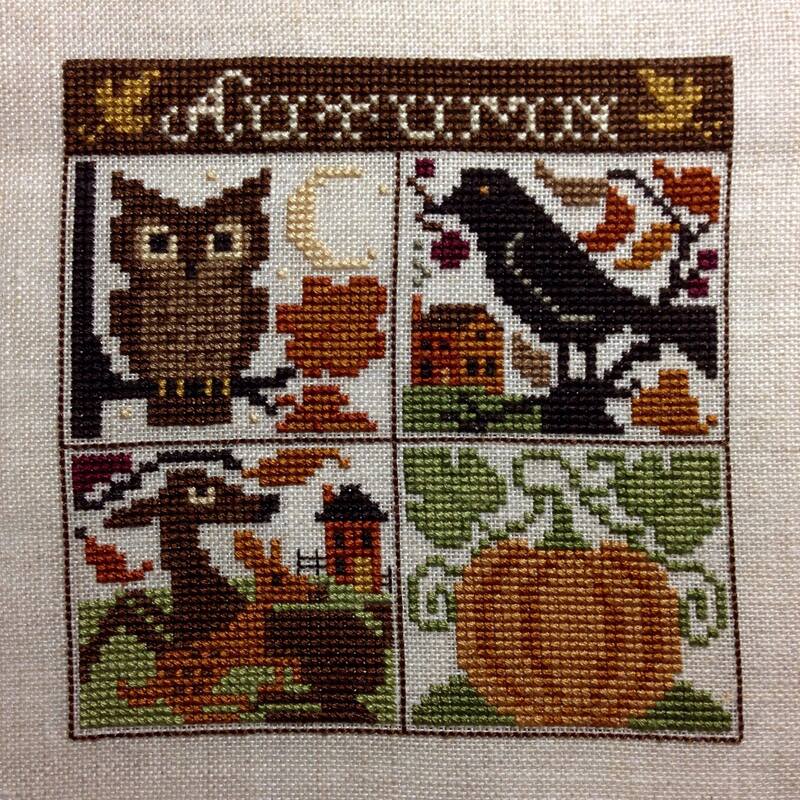 “Halloween Mystery Sampler” by Lizzie*Kate – This one was a gift from my Mum for Christmas when the designs were first released. I also purchased the Tin Roof fabric that was recommended for this one, but really didn’t like it at all, so it sat in a box for ages while I found something else. I’m still not 100% with this choice either, but I certainly like it a lot better than the Tin Roof one! 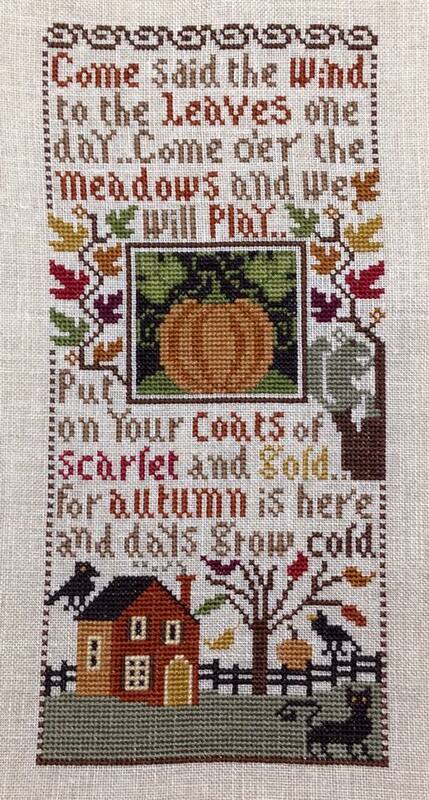 I started this one as part of a Sampler SAL, and really enjoying stitching it! 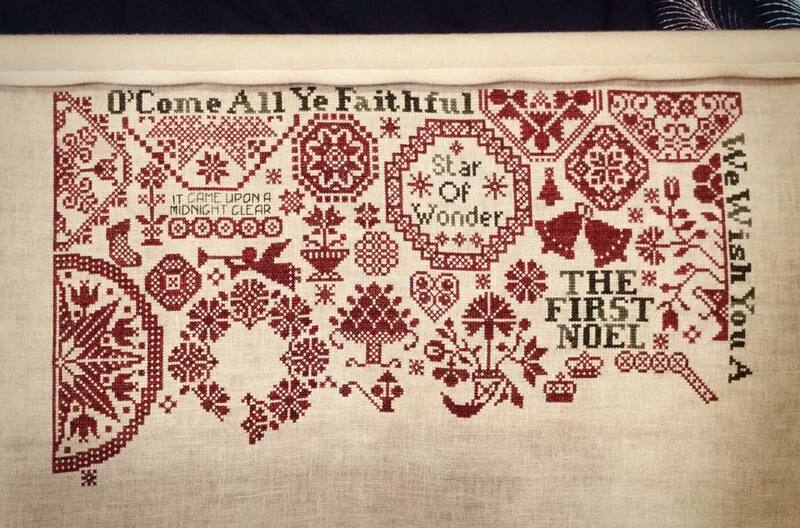 “Quaker Christmas II – Songs of the Season” by ByGone Stitches – This is another one I’m really struggling with, as I can’t stand the fabric I chose to stitch it on. It’s on a 35ct Weeks Dye Works fabric, and it’s just dreadful – it feels like I’m stitching on an old rag! Anyway, the chart itself is at least enjoyable to work on, I just need to forget about the immense size of this one and keep focusing on one motif at a time. 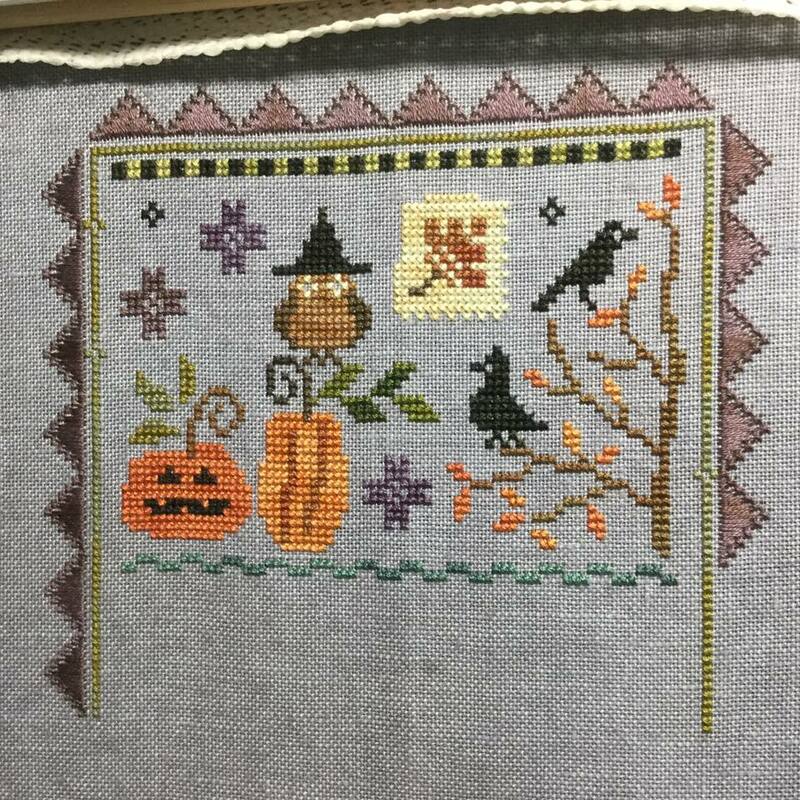 I haven’t worked on it for well over a year, then when Mum came to visit a month or so ago I sat and stitched on it while we were both sick and watching TV all day. It was a good design to work on when you didn’t have to concentrate too much! I actually managed to do a lot more than I thought I had … I’m now almost 3 pages down, and only about 12 left to go … haha.